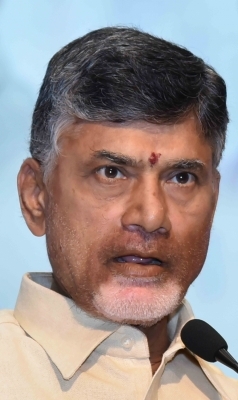 Nanded (Maharashtra)/Hyderabad Sep 14 (IANS) A Maharashtra court has issued non-bailable warrants against Andhra Pradesh Chief Minister N. Chandrababu Naidu and 14 others in a 2010 case pertaining to an agitation against the Babli Barrage on River Godavari an official said here. Judicial Magistrate First Class Dharmabad Court (Nanded) N.R. Gajbhiye on Thursday issued the NBWs against Naidu and his cabinet colleagues Irrigation Minister D.U. Rao Social Welfare Minister G.Kamalakar and 12 others. The police have been ordered to arrest them and produce them before the court at the next hearing on September 21. The incident took place when the Telugu Desam Party (TDP) had organised massive protests over what it termed the "illegal constructions" of the Babli Barrage project by the Maharashtra government allegedly to divert Godavari River waters from Telangana region of the then undivided Andhra Pradesh. At that time Naidu was the Leader of Opposition in the state and along with 40 legislators had entered the barrage vicinity flouting prohibition orders clamped there. The police had caned some protesters and later arrested all of them. Later as Naidu refused to take bail he was sent back to Hyderabad by a flight and subsequently cases were filed against all agitators on various counts. The court orders came after a petitioner moved the Dharmabad court seeking to know why the earlier arrest warrants were not executed. The TDP on Thursday reacted sharply to the warrants against Naidu and alleged that Prime Minister Narendra Modi is behind the conspiracy. TDP leader Buddha Venkanna told reporters in Vijayawada that the Bharatiya Janata Party is resorting to witch-hunting. Naidu s son and state IT Minister N. Lokesh told the media that while legal opinion on the issue has been sought the Chief Minister would attend the court hearing next week.